Had a lady say a prayer right before she put her vehicle sideways into our lane. Shaken, but not hurt, thanks be to quick reaction, and safety standards. Anyhow! Rented a minivan. Toyota Sienna. Its a nice vehicle. For a soccer porter. This particular vehicle was kept below my level of satisfaction. Upon renting, the representative took us out, to warm the car, and to discuss the features. After 10 minutes of that, all while the dash chirped incessantly to inform us that a sliding side door was ajar, the rep wished Id luck, and went back into his warm office. We tried, and tried to seal the door, by trying to pull it open. Finally, I decided that I was either going to pull the door handle off, or I was going to get the rep back. So I called him back, and, to my own disappointment, I rather sharply, told him that I wasnt going to be responsible for tearing the door off, and that he could come get the vehicle prepared, or we were leaving, without their business. The rep came out, grabbed the door handle, struggled for maybe just over a minute, and then broke the door free, without damaging anything. So, that dilemma was out of the way. We thanked him for helping. Our experience at Budget took the better part of 3 hours, due to financial issues, payments not going through on time, and balances having to be moved. Which, is certainly our doing. We could have been more prepared, and had money freed up. But, unfortunately, we did not. Eventually, it worked. Paying 5 times the one hundred dollar deductible, due to our only payment option being debit. But, we made it work. Another dilemma out of the way. So, we get the vehicle to the road. We turn onto a snowy, slushy arterial roadway, and get in with traffic. The vehicle in front of us, was issuing a fine mist, and a rooster-tail off the rear wheels off his truck. Not matter, I pull for the wiper blades. The top half inch, and the bottom half inch come clean. The 3 feet in the middle becomes a slurry of road mud. Nearly resulting in an accident. Upon further inspection, the blades were stock, upon a3 year old minivan. OK addition, the weather stripping around the windshield had begun peeling, and, judging by the weather cracks to the plastic, that damage was getting old. But, no matter. Resigned to making the best of our 1 week without our own vehicle, we decided to visit a friend, out of town. To make a day trip. One hour drive, one way. So, we set out. As we concluded our visit, we turned our headlights down the road. The effect was lesser to a pair of jam jars, with a sprinkling of glow worms placed inside each. We returned the car the next week, and have never been so happy to return a car-for-hire. Budget, if I may offer some advice: I maintain my vehicle to operating standards which, I admit, may faulter from time to time, but they are things which, as the owner, I know to expect. Things like windshield wiper blades, and headlights. I wouldnt lend my car out in sub-par condition. I certainly wouldnt enter into a business agreement, to provide sub-par vehicles to members of the public. Without wanting to over-exaggerate, I believe the actions taken by your corporation, and by extension, your staff, constitute negligence at best. I suggest reviewing your maintenance logs, to ensure compliance to better road-ready the vehicles which are being driven by members of the public which may not be familiar with them, in perfect running order. Let alone in a state of disrepair. Apologies for being so long winded, and I wish next time to leave a much more positive review. Thank you for your time. Ive rented here quite a few times actually since moving here in November. I was also hesitant at first due to the poor reviews I read - but you should be careful with any agency if you do your due diligence - such as ensuring you go around the car and do the spot check with them. Dont glance, get right in there and ensure they take note of any superficial marks, then take photos of anything you notice before you leave the property so that you are equally protected. Anyhow Ive had nothing but a great experience with this location. The customer service has always been excellent and they are always smiling - even when some people give them a hard time as Ive witnessed. They carefully explain their policies so it should be of no surprise that people dont know whats going on. A key point to remember - since moving here, if you opt out of special insurance ensure that you are protected by your credit card. Ive noticed a lot of people here have cracked windshields and this is a result of the government using rocks/sand/gravel on the roads in the winter vs. salt like Ontario. Therefore even the smallest car in front of you can fling a rock into your rental causing it to crack. We were driving up to prince Rupert when our car had problems. So we needed to go to Kamloops to rent a car. It was Sunday and "budget car" was the only place open. We looked all over the car to see if there was any damage. There was a cut in the right front tire but it seemed okay. In Prince Rupert we hit a small 2 inch curb with that tire and It busted and went flat. We reported it to Budget rental but they refused to pay us back for the cost of the tire which cost well over $200 plus the hassle of changing it. I have heard some bad things about Budget rental. This was an experience that I dont want to repeat again. My buddy had a flat tire with another company years ago and they gladly reimbursed him for the tire. Ive rented cars from them twice now and gone in a couple of times to enquire about fees after as well, and they are always amazing. Any time there has been a fee I believe I should not have been charged for (just simple misunderstandings) they have always been good about adjusting and refunding, even a month after the rental. They really went above and beyond, I was not expecting that kind of stellar service from a car rental company. Great prices, great staff, great car selection! No complaints about them at all. They are straight to the point, no gimmicks. 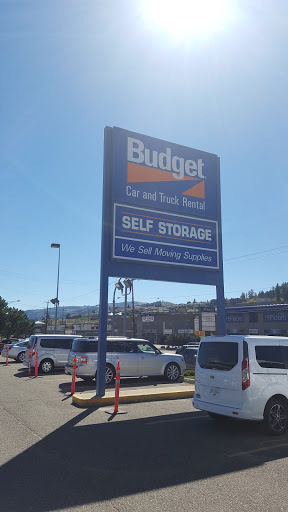 I would highly recommend renting a car or truck from them as opposed to anywhere else in Kamloops. Very happy with them! Rented a cubed van. Filled it up 5 KMs from rental store. A week later I get a $10 charge on my visa with no explanation. I call budget and they tell me it wasnt completely full so I was charged. I tell the lady I drove it 5KMs and filled it up until the pump clicked off. I was told their pump added more fuel so I was charged. The funny thing is I drove the truck 20 KMs total. Beware of the gas scam. From my experience this is a place that you cannot trust with your credit card number. They required a deposit that was never returned and even three months later you may receive some extra unauthorised charges show up on your card with absolutely no explanation. I was told over the phone if I showed up at 8am I would get first pick, so we did just that. We rented the crossover 6-passanger SUV we needed. They over charged us by $100 but when I called to explain they refunded it. Good customer service.